BJP's loss of power in Madhya Pradesh, Rajasthan and Chhattigarh means that it will have to face a resurgent Congress in the three states where it had emerged victorious in 62 of 65 Lok Sabha seats. Bharatiya Janata Party president Amit Shah has often asserted that his party will better its 2014 tally of 282 seats in the next Lok Sabha polls, but such a task now appears a stiff climb as it battles a united and energised opposition in the states that fuelled the saffron surge. Before the disappointment of the latest round of assembly polls, the Narendra Modi juggernaut was rolling ahead since the spectacular victory of 2014, when the BJP won close to 80 per cent of Lok Sabha seats in eight states including Madhya Pradesh, Rajasthan and Chhattisgarh. Now, its assembly election loss in these three Hindi heartland states has added to the BJP's woes, as the party faces challenges from a resurgent Congress and alignment of opposition forces in states like Uttar Pradesh, Gujarat, Karnataka, Maharashtra and Bihar for the 2019 elections. These eight states had given the BJP a whopping tally of 221 out of their 287 Lok Sabha seats in 2014. While an alliance of the Samajwadi Party and the Bahujan Samajwadi Party threatens to upset the BJP's equation in Uttar Pradesh, where it had won 71 of 80 seats against a divided opposition, the tie-up between the Congress and the Janata Dal-Secular in Karnataka has made the going tough for the party. The BJP had won 17 of 28 Lok Sabha seats in the southern state in 2014 when the Congress and the JD-S had fought separately. In Gujarat, the Congress had given the BJP a scare in the 2017 assembly elections, winning 81 seats against its 99. With the Congress on an upswing, a repeat of the 2014 clean-sweep in 2019 appears far from certain for the BJP in Prime Minister Modi's home state which had elected his party's nominees in all 25 seats. A recalcitrant Shiv Sena has been giving the BJP a headache in another western state, Maharashtra, where the alliance of the two parties had won 41 of the total 48 seats in the last general elections. Peeved with its junior status in the state, Sena has announced that it will not ally with the BJP in 2019, though there are indications that it may bury the hatchet if the BJP offers its traditional Hindutva ally a better deal. The BJP has also suffered a setback in Bihar after its ally and Rashtriya Lok Samta Party president Upendra Kushwaha severed their ties and indicated that he may join the opposition camp of Lalu Prasad's Rashtriya Janata Dal and the Congress. The saffron party was also dumped by its Dalit ally and former chief minister Jitan Ram Manjhi last year. However, the BJP did get a major boost in the eastern state by winning over the Janata Dal-United president and Chief Minister Nitish Kumar. The BJP had won 22 of the state's 40 seats in 2014 while its allies picked nine seats. Its loss of power in Madhya Pradesh, Rajasthan and Chhattigarh means that it will have to face a resurgent Congress in the three states where it had emerged victorious in 62 of 65 Lok Sabha seats. Shah has marked states like Kerala, Telangana, Andhra, Odisha and West Bengal as the growth region for his party in 2019. The BJP had fared poorly in these states in 2014 and its top brass is of the view that they may make up for the losses the party may suffer in other states. 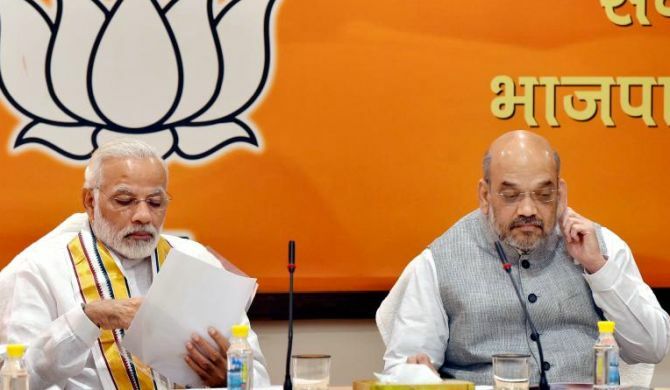 However, political watchers are of the view that the saffron party has not so far made much inroads in the southern states, highlighted by its poor show in Telangana where its tally in the assembly polls fell to one seat from the earlier five. The view within the BJP, although, is that the Lok Sabha polls will be a different ball game, and the 'Modi factor' coupled with the absence of a opposition leader to match his charisma will help it retain the power at the Centre in 2019.